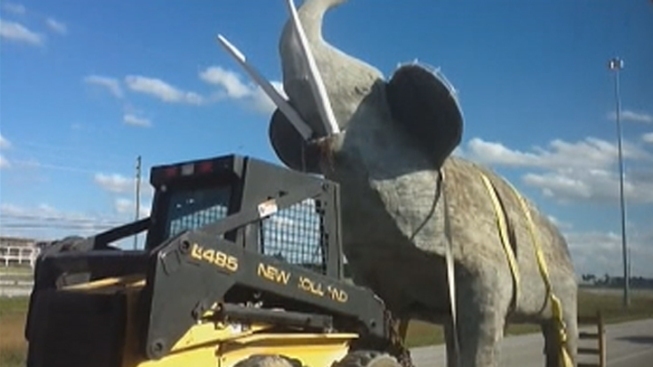 Huge Elephant Statue Becomes Hidden Ark's "First Rescue"
Drivers on Florida’s Turnpike were doing double-takes Sunday as they saw a life-sized statue of an elephant on the move. The tale of the elephant began at a southwest Miami-Dade home months ago when Reinol Fernandez put the statue he built in his front yard and was ordered by the county to remove it. But the amateur sculptor had nowhere to move his statue. He was willing to donate the art, and his daughter contacted NBC 6, but every organization we called would only accept art from a renowned artist. That was the case until there was a match many might say was made in heaven – when an organization called the Hidden Ark came knocking. The Hidden Ark is the dream of four South Florida men who have begun building a 500-foot wooden replica of Noah's Ark in the hopes of turning it into a shelter for animals in Hialeah. “The people at the Hidden Ark contacted us yesterday and presented the idea to my father of his elephant being placed on the park grounds,” Damaris Fernandez said. Reniel Aguila, the ark's architectural engineer, said Sunday they were making their "first rescue," referring to the statue. As the statue was being loaded onto a trailer to be transported, its creator got nostalgic. "It hurts," Reinol Fernandez said. He would have preferred to see it stay at home, his daughter explained.